Are you a small or mid-sized business looking for cloud hosting services and particularly VPS? Do you value open source as a concept? Do you lack the resources to assemble that software in a meaningful way on you own? If so, check out SkySilk. SkySilk is a cutting edge cloud services provider that offers some of the only managed VPS services built exclusively on open source software. Other cloud services providers tend to either not offer a managed VPS option – meaning you have to go through a third party – or offer managed VPS that uses proprietary software. In addition, SkySilk aims to provide you with a swiss army knife of cloud service tools, so while you will still need in-house developers, you can outsource the drudgery of systems administration and infrastructure building. They’ve already worked out modules they can snap together automatically to provide you and your team access to content management, e-commerce, private database, and other tools. Simple & Functional: Skysilk utilizes a combination of established hardware and open-source software, making spinning up and scaling out thousands of virtual machines as simple as a few clicks. Affordable & Cost Effective: Whatever your project requires, SkySilk offers a range of cloud services and payment models to suit it. They are able to offer lower prices and cost savings benefits that make sense for any business or developer by managing and consolidating cloud resources at every layer. Through the use of open source technologies, SkySilk is able to offer extremely competitive prices that are among some of the cheapest cloud prices currently on the market. Elastic Scalability: SkySilk is a custom public, hybrid, and private cloud infrastructures which makes automating, scaling, and ultimately deploying intensive workloads an easy reality for any business application you may need. They give you the ability to instantly deploy multiple virtual machines and scale them in real time based on demand. You can even deploy a fully functioning cloud infrastructure on-site in an hour or less! Open Source Technologies: SkySilk has taken the initial legwork out of server setup and system administration through the use of open source software such as ProxMox VE, Ceph™, KVM, and QEMU, among others. This lets you and your team can focus more time on innovating and less money on infrastructure. Reliability & Data Security: SkySilk promises to treat your data as if it was their own, and has integrated multiple layers of security into all of their products to ensure the highest levels of integrity and security possible their customers, giving you and your business peace of mind. The SkySilk cloud platform is currently in beta, and beta users receive access to cloud platform and computing resources free for a limited time. 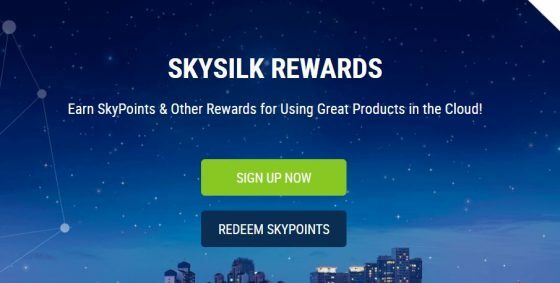 In addition to the above-mentioned freebies, beta members also receive SkyPoint Rewards Bonuses which are redeemable for Visa Cash, Amazon.com, and Best Buy Gift Cards, as well as other beta member perks and discounts which are redeemable when the SkySilk Cloud Platform comes out of beta.